On 17 February 2015, seventeen year-old American-Bahraini Abdullah Jaffar was sentenced to two years in prison. Charged with participating in illegal gatherings, possessing Molotov cocktails, and attacking a policeman, his conviction was based exclusively on a false confession he provided after enduring sustained physical abuse at the hands of security officers following his arrest on 10 March 2013. Shockingly, Jaffar’s case is not unique. More than 200 minors are currently in prison in Bahrain, half of whom are housed in adult facilities. Under Bahraini law children under the age of fifteen are not considered criminally responsible, but this does not stop the government from subjecting minors to adult courts and severe physical abuse. In December 2013, ten-year-old Jehad al-Sameea was arrested while playing near his grandfather’s house and detained for 43 days. He was sentenced to one week in prison in May 2014 under charges of participating in illegal gatherings, charges he denies. The Government of Bahrain’s treatment of its youth violates the Convention of the Rights of the Child (CRC), a convention Bahrain ratified without reservations on 13 February 1992. What’s more, as a result of such arbitrary arrest and detention, minors are denied the chance to obtain an education. Such was the case for sixteen-year-old Nedhal Ali Hussain al-Abood, who was arrested on 24 September 2013 without being shown an arrest warrant when security forces raided his home. After enduring 48-hours of incommunicado detention and severe physical abuse, al-Abood signed the forced confession that was used to sentence him to life imprisonment under Bahrain’s terrorism law. While an appellate court reduced his sentence to fifteen years, al-Abood was unable to take any of his final exams and has yet to complete his schooling. 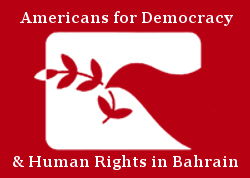 In an attempt to raise awareness of these severe abuses, Americans for Democracy and Human Rights in Bahrain collaborated with the Bahrain Center for Human Rights and the Bahrain Institute for Human Rights to educate the public using the voices of current child prisoners. The result was the Dear Penpal exhibit, which features letters written by imprisoned children describing the injustice they have faced. ADHRB calls on the Government of Bahrain to reform its juvenile criminal justice system. By releasing all children held in adult facilities, enforcing laws that forbid children under 15 from being tried as adults, and ending the use of the 2006 anti-terrorism law to sentence minors, the government can give these children the bright future they deserve and prevent others from experiencing similar treatment. Patrick Seed is an Advocacy Intern at ADHRB.